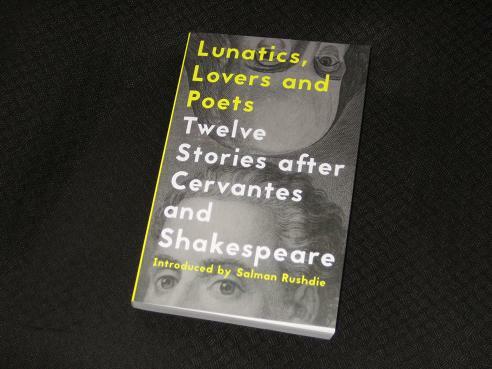 Lunatics, Lovers and Poets: Twelve Stories after Cervantes and Shakespeare does exactly what it says on the cover. Those wonderful people over at And Other Stories, in conjunction with the Hay Festival, have taken advantage of the fact that Shakespeare died on the same date (if not the same day…) as Miguel de Cervantes Saavedra to commission stories from twelve authors to commemorate the two literary legends. Six English-language writers have taken on the task of producing a story inspired by the creator of Don Quixote, while six of their Spanish-language counterparts tackled the job of coming up with a Shakespeare-inspired tale. Of course, this entailed the need for a translator or two, and editors Daniel Hahn and Margarita Valencia have put together a fine team of twelve (six for the Spanish-language version and another half a dozen, familiar faces all, for the edition I read) for the occasion. Throw in an introduction by Salman Rushdie, and it all makes for an enticing proposition. Afterwards all one heard of him were legends. He had waged battles with corrupt government officials, and embarked on campaigns in the forests of the North where Boko Haram terrorised the nation. It was even rumoured that he had been selected to join a resettlement programme on Mars. These are stories his madness generated. It is hard to say whether his deeds exceeded our imagination, or whether we are poor reporters of the marvellous. This (meta)fictional encounter, in which a print worker narrates his impressions of the great man, introduces us nicely to the style of the stories in the collection. Other writers take a more tangential approach to Cervantes’ major work while also taking the story on the road. Kamila Shamsie’s ‘Mir Aslam of Kolachi’ is set in Pakistan and features an ageing storyteller with a desire to travel abroad, a man whose tilting at bureaucratic windmills can only be described as Quixotic. Hisham Matar’s ‘The Piano Bar’ instead takes us to Egypt, where a returning ex-pat, carrying a copy of Don Quixote into a bar, is sucked into stories of the past when he encounters a couple of familiar faces. By contrast, the Spanish-language writers have chosen a far wider range of inspirations for their pieces. In Juan Gabriel Vásquez’s ‘The Dogs of War’ (translated by Anne McLean), a class on Shakespeare’s Julius Caesar evokes memories of an assassination far closer to home. The story switches between the lecturer preparing his notes and the deadly cat-and-mouse game Pablo Escobar plays with his enemies. An excellent, taut tale, it manages to tie the two strands together unexpectedly on its last page. We often cling to our past selves, not allowing new things a fair chance. Which goals replace outdated ones? What ideals do we keep when we discard old ones? When you look at it this way, the passage of time is terrifying, because, as we gradually let go of our baggage, we grow further and further from ourselves. If you’re going to take inspiration from the classics, though, you might as well let your imagination run wild, and two of my favourite stories in the collection have certainly taken that advice to heart. Valeria Luiselli’s ‘Shakespeare, New Mexico’ (tr. Christina MacSweeney) follows a Mexican family living in the US as they relocate to a historic ghost town, employed to act in a Wild-West-era never-ending show. Although it starts slowly, by the end the story cleverly weaves in comments on contemporary issues, such as migration and gun control, all the while developing the character of the mother of the family, a modern-day Lady Macbeth if ever there was one. Yes, this country’s ‘twelve finest writers’ are tonight congratulating themselves on the launch of their dubiously conceived and pretentiously named ‘The Anthology’, a collection of short stories celebrating the four hundredth anniversary of the death of Cervantes, who will no doubt be turning in his recently located unmarked grave. I’m glad you reviewed this and pleased to hear that it’s successful. This kind of compilation can be hit and miss. I subscribe to And Other Stories, so I do have this book. It looks good, but I imagine I will probably approach it piecemeal in between other books. It seems I am approaching a lot of books that way lately. Joe – Not every story is a complete success, but plenty are 🙂 It’s a wonderful idea, and an example of how And Other Stories can stand out from other small presses focusing on translation at times with a mix of ideas (and with some English-language works drawing attention too). Stu – Definitely one to try, the kind of book that could cross over successfully into the mainstream too. Looks like a really excitibb read. I’m planning to read Cervantes and Shakespeare’s works in the near future and I think this is a perfect complement of their classical works. Great review though! The atmosphere created in “The Piano Bar” is perfect.The reference to “Don Quixote’ is with the narrator reading a copy whilst being included and then, excluded from an intriguing business meeting.Like all great short stories it alludes to other narratives that merit telling in their own right and his father’s tale begs just that. The tone achieved is remarkable and the claim we can only best read “Don Quixote” as a brilliant child is probably true. I had to wait a life time to unlock the old chevalier, if I have. I was just looking for books translated by Daniel Hahn, and came across this title in Amazon. The 2 reviews were opposite: very good and very bad. I decided to check other points of view and found yours. It was the nudge I needed. the book is in my wishlist and will get it in early November. As a translator of books, I have to thank you for citing the translator’s name in each story. We get so little spotlight! I already know Anne McLean’s work, as she has translated into English the best of the Colombian recent authors (I’m Colombian). Now I’m curious to read Valeria Luiselli’s story in translation. Not that I have read the original version, but read a book by her earlier this year and was blown out by her writing. And I know she writes in English too, so I’m sure she worked along with the translator. I’m sorry for all the details of the craft… as an editor turned translator, reading a book is not only reading a book but delving into the mind of the author and/or the translator, and their literary toolkit. First of all, thanks for your conscious effort to highlight translators, Tony. Thanks also for your reply! I will certainly look for the Spanish-language version. I will be able to compare versions and maybe I can use something in my courses. It is a summer afternoon here in Uruguay now and I am about to finish this amazing book. I just loved it. I had the pleasure to meet Daniel Hahn when he visited Montevideo last year, an honour and lots of food for thought! Fio – Thanks 🙂 It’s a wonderful little collection, and I’ve also been lucky enough to catch up with Daniel Hahn here in Melbourne – he’s a real globetrotter!